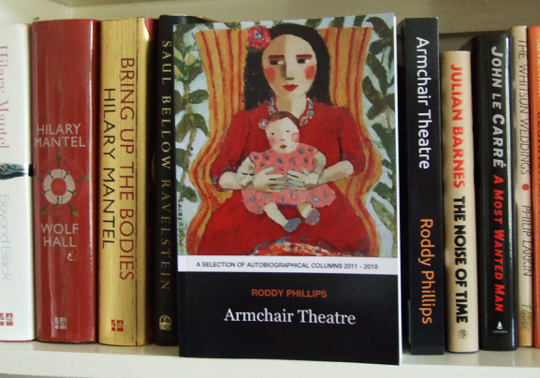 Armchair Theatre is the latest volume of my autobiographical newspaper and magazine columns. It features a selection from 2011 – 2018 and is available on amazon worldwide as a paperback and a kindle. LP Hartley said, “the past is another country: they do things differently there.”For me the past is a newspaper column I can’t remember writing, about stuff I can’t remember doing.Since the late 1980’s I’ve written about my family life and times in humorous columns for various newspapers and magazines. Since 1994 I’ve written a weekly column for the grand old Scottish morning newspaper, The Press & Journal, the circulation area of which is larger than Belgium. Obviously there are a lot less sheep in Belgium. To my amazement the columns proved quite popular and they were first published in book form in 2009 under the title, ‘The Familiar’ by the Edinburgh publisher Black & White.Like all the best career moves the idea of writing a ‘living autobiography’ happened by accident. The first column was written to fill an unexpected hole in a newspaper. The deadline was tight so I used what was to hand, namely my family’s recent move to the country, an event we are still recovering from. Before I knew it one column had turned into a thousand. Most writers would have something better to do, but the truth is, when you get paid to hang your dirty linen out to dry, it becomes addictive. The selection in this volume dates from 2011 to 2018 and marks my family’s move from rural Scotland to the sunny south east coast of England.Happily I’ve never stopped doing stupid things so I’ve always had plenty of material to work with. No barrel was ever scraped during the writing of these columns. I was expecting to see Chris behind the counter of his record shop Vinyl Frontier, instead there was a punky young girl. Punky probably isn’t the right adjective but my youth culture lexicon is forty years out of date. “I see the tablets are working Chris,” I said. My wife rolled her eyes but the girl just gazed at me with a Poker face. “Chris is normally a bloke,” I explained to my wife. “Well he’s not today,” she muttered and went off to seek solace with Joan Baez. I think I said punky, more because of the girl’s attitude as opposed to her vivid blue mohican, heavy black eye-liner and multiple piercings. She didn’t look as if she suffered vinyl fools lightly. Apparently Chris was out to lunch and had left Miss Congeniality manning the decks. There was a sulky Leonard Cohen song groaning in the background that matched her face. The girl may have shrugged it was hard to tell. Undettered by her charm offensive I explained how I was on a marketing drive for my writers’ workshop and asked if I could replace the poster in the window with a new one. The current one looked like it had jaundice. But the girl didn’t have the authority to approve poster replacement. So far our campaign wasn’t going well. Earlier in a nearby newsagent the grumpy elderly owner had refused a poster on the grounds that he hated books. “And writers!” he added before plunging into a phlegm-splattering coughing fit. I put the poster on the counter and assured punky girl there wouldn’t be a problem, but her attention had wondered back to her computer screen. “Do you have any ukelele records?” asked my wife from the depths of the heavy metal section. The girl was about to reply, probably to say something like ‘just what’s there’ which is the stock answer to most questions asked in a record shop, when a woman bustled in with her young son. She seemed quite excited and was obviously on a mission. Punky girl and I looked at her with casual indifference. Sensing impending embarrassment Tobes had already dislocated himself from his mother and was trying to blend into the Jazz-Rock section. Chris once told me that a bloke came into his shop with a machete and asked if he could sharpen it for him. It’s this kind of thing that has always put me off working in collectable retail. The punky girl said nothing for a moment. My wife and I meanwhile pretended to rifle enthusiastically through the 70’s Prog Rock section. Glancing at the girl I could see she was still sizing the woman up. Tobes had now thrown his lot in with us and was up to his nose in Tubular Bells. He looked about 10 or 11 years old when he came in, quite young to start a record cover wall. But on closer inspection I think he was about 13. “No problem then, because we don’t want the records, just the covers, don’t you keep a supply of spare covers?” replied the woman. “The weird thing is right, for some reason people who buy records also want the covers,” said the girl very slowly as if she were explaining some complex abstract maths problem. The woman looked genuinely surprised. Again the girl sucked all this in and chewed on it. It was at this point that I began to appreciate how cool she was and not in an unflustered sense. “There are boxes of cheap records underneath the racks,” she said, pointing at one box in particular. The woman lit up and started rummaging in the box, but the first record she pulled out was a Gary Glitter album entitled ‘Touch Me’. Wincing, she turned sharply away from it as if it was painful to look at, then holding it at arm’s length she pushed it quickly back into the box. Punky girl was smiling to herself as they left, but I wasn’t. Outside I could see the woman peering at my faded poster and typing my number into her mobile. Time to take cover.